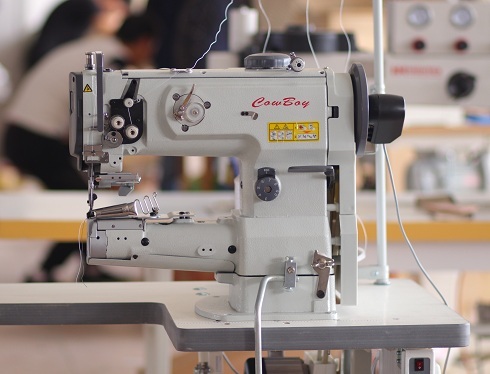 Steve's Industrial Leather Sewing Machines is the authorized dealer of full linkage CowBoy leather sewing machine, as well as Hightex series heavy duty automatic pattern sewing machines and bar tacking machine. 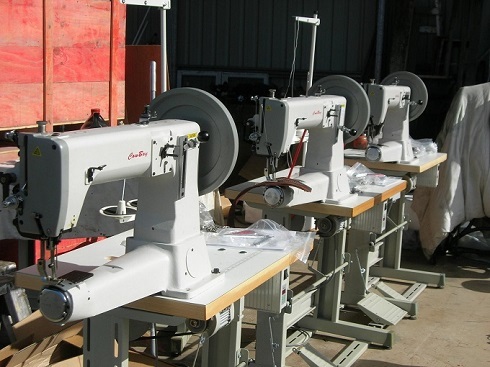 Cowboy Heavy Duty Industrial Sewing Machines are Australia's largest leather sewing machine supplier. 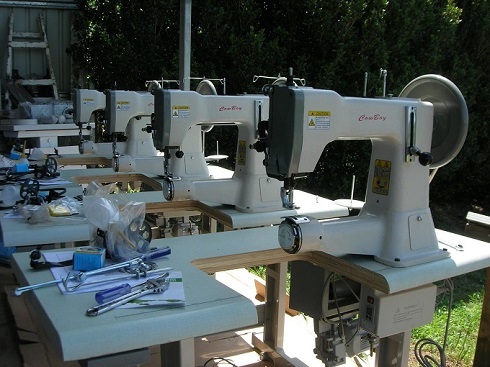 Offering machines to saddlers, upholsterers, trimmers, collectors, sail making, equestrian, museums and backyard enthusiasts. We locate in Gooburrum, Queensland , and deliver machines throughout the Australia, included Brisbane, Sydney, Melbourne, Perth, Victoria and others. Cowboy CB3200 medium heavy leather sewing machine: this machine has compound feed, ie walking foot and needle feed plus reverse and is popular with saddlers and leather workers. In particular used for belts, bridles and saddle skirts. It will sew heavy leather to 15mm thickness. Cowboy CB 4500 Saddlery and Harness Sewing Machine: Australia's favourite biggest selling saddlery and leather work sewing machine. Get what the professionals have ! !1 year parts and labour warranty. This leather sewing machine comes on the new heavy pedestal table, this is the legendary Cowboy machine that the saddlers and leather workers use. This leather stitching machine is ready to go with everything needed to start work, there are left and right toe fee, double toe foot, roller guide, stirrup plate, holster plate, speed reducer and 750 watt powerful servo motors. Cowboy CB7205BV heavy leather and upholstery sewing machine: very heavy walking foot cylinder arm sewing machine with reverse. This heavy machine is priced for the budget minded, its ability to sew up to 18mm of leather puts it into the saddlery bracket of heavy machines, but much cheaper than the CB4500. Cowboy CB 105 leather industrial sewing machine: Cowboy CB105 similar to the Singer 45k25 Leather, Harness, Horse Rug Sewing Machine with Reverse. Famous unbeatable Cowboy brand, 12 months warranty, comes with blanket foot, double toe leather foot, roller foot and edge roller guide. Used by leather workers for belts, bags, canvas, chap, canvas, webbing, horse rugs etc. Cowboy CB7132UL-16 upholsterer and canvas workers sewing machine: Mighty Cowboy long flat bed heavy upholstery and canvas workers sewing machine. Has a brilliant walking foot and reverse. Warranty parts and labor 1 year. Will sew to 12mm thickness. Comes on heavy industrial table with 750 watts servo motor, standard double toe feet, binding set, piping feet and roller guide. Medium to heavy duty cylinder bed compound feed leather sewing machine for handbags, shoes, belts, carpets, furniture upholstery and leather crafts. The newly developed mode of highly rigid rectangular feed guarantees outstanding feed performance. The ratio between the alternating vertical movements of the walking foot and presser foot remains unchanged even when the material thickness changes. This industrial leather sewing machine sold by Australian Cowboy Leather Sewing Machines Co in Queensland, Australia. 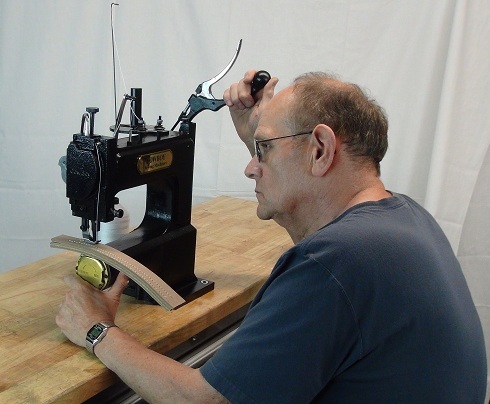 This affordable hand crank leather sewing machine is an economical alternative to heavy duty motor industrial sewing machines for gun holsters making, knife sheaths, leather bags, leather belts and manufacturers of harnesses. Designed to provide years of dependable trouble free operation, the OUTLAW is destined to become a mainstay in your arsenal of leather working tools. It is also the best leather sewing machine for the beginners. This portable leather sewing machine sold by Australian Cowboy Leather Sewing Machines Co in Queensland, Australia.